Here’s some recent GMO news. Lots going on and we are making progress! Dannon made waves in the food industry by announcing several big steps forward on sustainability, including a broad non-GMO commitment that encompasses non-GMO feed for the dairy cows that supply its milk, and voluntary labeling of GMOs no matter what legislation Congress passes on labeling this year. The yogurt giant also stated it will move away from synthetic additives. Green America congratulates Dannon on its food industry leadership towards greater social and environmental sustainability. By transitioning towards sustainable agricultural practices, and moving away from synthetic additives, Dannon is setting a high bar for the conventional dairy products industry. Dannon’s adoption of sustainable agricultural practices will help encourage soil health, carbon sequestration and water quality, while ensuring good environmental livestock production practices. Working with family farms, these practices will help increase animal welfare and reduce the environmental impact of dairy production. Additionally, Dannon is making a commitment to clean and natural products. By transitioning away from the use of synthetic hormones and routine non-therapeutic antibiotics, Dannon is making great strides toward healthy products sourced from ethically treated animals. 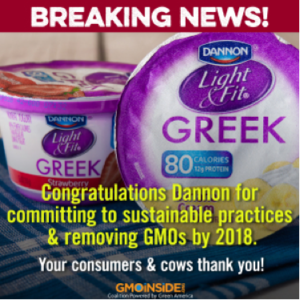 In line with committing to clean and natural products Dannon has committed to transitioning away from all genetically modified ingredients (GMOs) including animal feed. This is an unprecedented step that will reduce the negative impacts of GMOs, and encourage more farmers and producers to transition away from GMOs. Since the majority of all crops in the U.S. are grown for animal feed, improving the sustainability of feed crops is essential for a healthier food system. Prior to transitioning away from all GMOs, Dannon will disclose any GMO ingredients on package by December 2017, breaking from the Grocery Manufacturers Association that has been fighting against clear GMO labeling. This agreement will provide consumers with the transparency they demand from the food system. Overwhelmingly, Americans want to know what they are eating. In fact, 90% of Americans want foods made with GMOs to be labeled. Thanks to the actions of hundreds of thousands of individuals across the country over the past few years, companies like Dannon are now listening to consumers, labeling and transitioning away from GMOs. This is what leadership looks like. We encourage consumers to give a shout out to Dannon on the Dannon Facebook page and share this big news on social media.